Presidential aide Arkady Dvorkovich is confident that there are no - and will be no - disagreements between the Kremlin and the government regarding the objectives of the country’s economic development, nor about the main tools for their achievement. Presidential aide Arkady Dvorkovich is confident that there are no – and will be no – disagreements between the Kremlin and the government regarding the objectives of the country’s economic development, nor about the main tools for their achievement. Experts, however, see some clear distinctions between President Dmitry Medvedev and Prime Minister Vladimir Putin’s approaches. One is ready to bet on liberal values, while the other seems to see the future in state capitalism. Meanwhile, for most Russians, these differences are not fundamentally significant. According to Dvorkovich, a wide-scale discussion is currently ongoing in regard to the formulation of economic development strategy. “So far, no one, including the president or the head of the government, has expressed their attitudes toward these concrete ideas and proposals. I am confident that, in the short run, this discussion will take place at the highest political level. I think that there will definitely not be any disagreements over the goals of development, they are the same. As for the main tools for their achievement, they are also the same. Nevertheless, differences may exist, which is normal, and they are sometimes obvious,” says Dvorkovich. Both the prime minister’s State Duma report and the strategic orientations which are being formulated by the president, share common ways to achieve goals, which seem to not have an alternative. This applies to the prospects of innovative development of the domestic economy, promotion of entrepreneurship, and Russia’s integration into the global economic space. “All of these things are the only ways of achieving our goals, and there is a consensus on them,” Dvorkovich stresses. At the same time, he acknowledges that, “so far, there is not a general published, declared strategy for the country’s development. This strategy is determined at the elections, when a certain party, a certain leader holds victory. And this does not necessarily require “some type of an official document,” he reasons. Independent experts do not share Dvorkovich’s opinion. They believe that some specific distinctions already exist between Medvedev and Putin’s attitudes in regard to the future of the Russian economy. Or, at least, these differences are evident to observers. “Dvorkovich is motivated by the interests of the ruling tandem, which benefits from maintaining the appearance of harmony, including on issues concerning the economic policy. In reality, disagreements do exist, but I do not know how they will be resolved,” says Evgeny Yasin, academic supervisor at the Higher School of Economics. According to him, during the last decade, the Russian economy has been managed “from the top down”. Development has continued based on the implementation of state programs, creation of state-owned corporations, and pouring of funds into the state budget. “The link between this approach and the reduction of business activity is evident. An independent observer will see that it is impossible to achieve anything by following this path. But Putin had created this system, and to him, it seems to be effective,” Yasin emphasizes. Medvedev and Putin are both lawyers by training. The economy is not their sphere of expertise. Therefore, they have gathered specialists, who must formulate a new version of the strategy, explains Mikhail Delyagin, director of the Institute of Globalization Studies. Supporters of liberal values have been invited to join the president and vice president’s teams. “The difference between the preliminary works of the two programs is insignificant. There are no ideological differences. Perhaps the only question, which has raised some controversy, is over where oil should be refined – in Russia or abroad,” notes Delyagin. According to Delyagin, Putin is ready to bring Russia back into the first decade of the 2000s, while Medvedev and his liberal clan favor the 1990s. Thus, according to Delyagin, both are looking back. The businessmen, who prefer the bandits of the 1990s to the law enforcers of the 2000s, sympathize more with Medvedev’s position. The West has also placed its bets on him, says Delyagin. As for the ordinary people who will vote in December’s parliamentary election, they do not see a fundamental difference between the Kremlin and the government’s economic policy, argues the expert. Aleksey Makarkin, vice president of the Center for Political Technologies, shares Delyagin’s view. According to Makarkin, public polls are showing a moderate rise in protest sentiments in Russian society, which is reflected in the presidential and prime ministerial confidence ratings. It is typical for these ratings to change simultaneously. Hence the conclusion that people do not see any fundamental differences between Medvedev and Putin, but are simply giving an overall assessment of the country’s leadership. According to Makarkin, Putin is associated with the preservation of a stable political system. He is open to a dialogue with the business sector, but at the same time, prioritizes the state in the implementation of industrial projects. 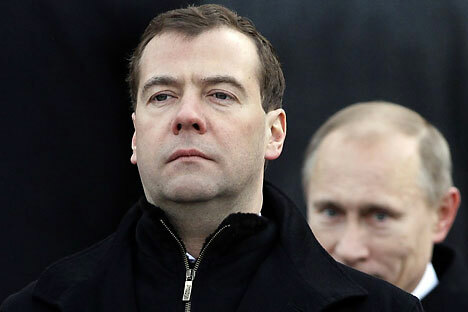 Medvedev seems to be an advocate of a more integrated approach. He is ready to support technological modernization with political modernization, while acting carefully and in an evolutionary manner for the sake of maintaining stability in the country.